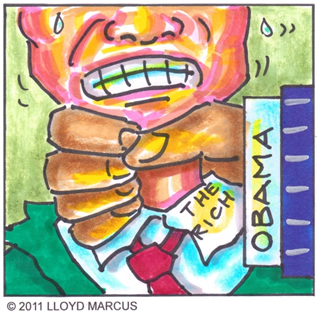 Obama's “Hate the Rich” campaign appeals to our lower nature and encourages the sin of covetousness. If Obama's despicable campaign proves successful, it will be a sad commentary about who we have become as a people and how far we have fallen as Americans. It angers me that Obama and his minions in the liberal media have put achievers, risk takers, on the defensive. It angers me that Obama's looser followers think they are entitled to the fruit of someone else's labor. Americans are extremely generous and willing to help people in need domestic and foreign. But no one is entitled to share in the bounty resulting from someone's risk, blood, sweat and tears. Any government which confiscates and redistributes wealth is immoral and evil. God has designed life that success requires backbone; in other words, taking risks. Playing it safe profits very little. God's system is anathema to liberals. They strive to achieve “equal outcomes” or “fairness”, as they describe it, via legislation and redistribution. Mary and I fed seagulls at the beach by throwing crackers on the sand close to us. Upon calculating the risk, seagulls moved in close and fed. Two bold seagulls feasted on crackers by feeding directly from Mary's hand. Then there were the seagulls who were too fearful to come close enough to retrieve any crackers. Interestingly, the cowardly seagulls screamed in frustration and even attacked the bold seagulls who were enjoying the rewards of their risk taking. If a majority of Americans have become spineless, lazy and envious seagulls demanding the government take from the courageous to give to them, the spirit of America is dead. Quite frankly, the entitlement mindset turns my stomach. My mom worked as a domestic cleaning white folks homes. My dad was one of the first blacks to break the color barrier into the Baltimore Fire Dept. My parents were hard working Christians and honorable people. My four younger siblings and I were not taught that anyone owed us anything. Today, we are all successful responsible citizens. I suspect the mentality of my parents was typical of most Americans in the 1950s. Charities and churches assisted the poor before government replaced daddies (President Johnson's War on Poverty) in 1964; enslaving the poor to a cradle-to-grave dependency on government solely to secure Democrat votes. This strategy continues to devastate the black family; over 70% of black babies are born out of wedlock. Blacks progressing from being brought to America as slaves to a black man being voted leader of the free world epitomizes the godliness and greatness of America. And yet, Obama and company, displaying a severe lack of character, relentlessly play the race, victim and class envy cards; designed to divide Americans to further the Obama administration's socialistic agenda. Great leaders appeal to their follower's higher nature inspiring them to dig deeper into their souls and soar higher than they thought possible for themselves. America's first president, George Washington was such an inspirational leader. As an American who happens to be black, I was badgered, “Lloyd, you should be delighted by the historical context of America electing it's first black president.” I was not. Feeling like a lone voice crying in the wilderness, I dared to follow the instruction of an extraordinary leader, Dr Martin Luther King Jr. Therefore, I judged Barack Hussein Obama by the content of his character rather than the color of his skin. Obama's admitted plan to “spread the wealth around” and his anti-American associations told me he was the wrong man to lead the greatest nation on the planet. Obama's divisive, dictatorial and bullying behavior have proven me correct. Our president is nothing more than a Chicago thug community agitator stirring up discontent, inspiring racial hatred and hatred for achievers. The bottom line of every Obama speech regarding the economy is you have too little because those guys have too much. Obama's approach is non-presidential, totally low rent appealing to our lower nature and totally despicable. Lord help us.